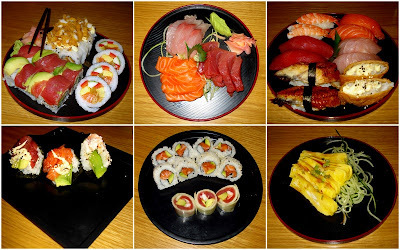 Anyone who has been eating sushi for many years knows that there are a few sushi "Masters" in Cape Town, some know them all, others know of 2 or 3 and some only know the ones they follow. Rock, in my most humble opinion, is one of those "Masters" (I know a few more but this isnt about them :P ). In the industry, Rock is known as the "go to guy" if you want to know which sushi chefs to hire and he has trained a fair few of the chefs in Cape Town. For many years we have followed Rock, from his days with Cape Town Fish Market, to Food Lover's Market and now to his own place in Table View. A cosy little place situated on beach boulevard, next to Ice Zeit (which is next to News Cafe), the place is so new he hasn't had a chance to change the sign from the previous owners, he's been too busy making fresh, good quality sushi. His prices are very reasonable on a menu FULL of choices and a note at the bottom urging you, if you dont see something you like, to just ask the chef for what ever you fancy. The ingredients are super fresh with no cutting corners to save money. Being in the industry as long as he has been, Rock has loads of connections and has no obligation to stick to a supplier if they cant get him what he needs (unlike at franchise locations). It was good to see local fish on the menu as well as firm favourites. Not working alone, Rock has recruited Jesse, also from CTFM and FLM as his second in command and together they make fantastic sushi.